​Tucked in a lovely pastoral setting, Bartlett Farms is a beautiful forty-five lot subdivision in Arundel, Maine. 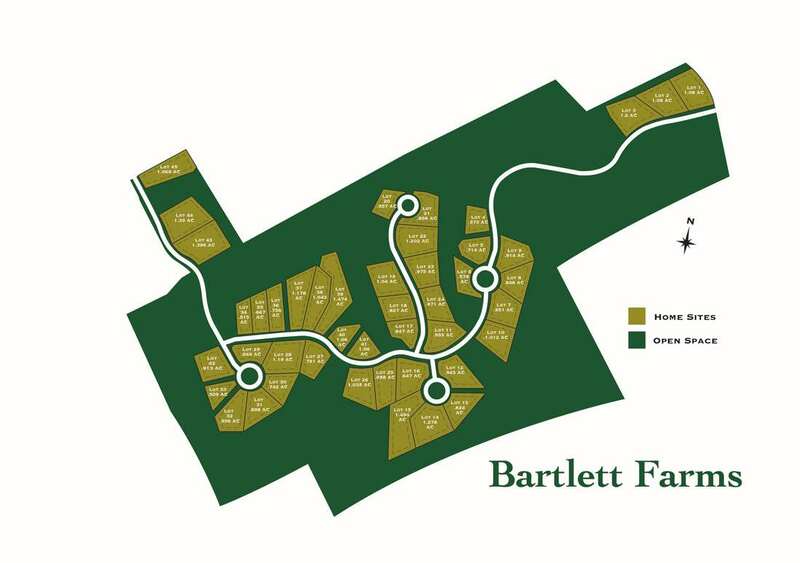 Bartlett Farms is the perfect location for the executive looking for an effortless commute to Portland, Portsmouth or Boston or for a family searching for the ideal Southern Maine home that offers privacy, a natural setting, convenience and a sense of community. Our professionally designed homes start with standard finishes like hardwood & tile, quality cabinetry and granite countertops with many upgrade options to suit your family's needs. Surrounded by more than 100 acres of open space and conservation land, our home sites range between half and one and a half acres. Preserving the view and open space, each home will be served by underground utilities, private wells and septic systems. ​Contact us to schedule a tour or to learn more about our home packages. Part of highly regarded RSU 21 School District with Kennebunk & Kennebunkport. High schoolers can choose either Kennebunk High School or Thornton Academy. Bartlett Farms is located on Tamrox Drive in Arundel, Maine. From I-95: Take right onto Route 111 to left onto Old Alfred Road and right onto Tamrox Drive. From Biddeford: Take Mountain Road to right onto Old Alfred Road and then left onto Tamrox Drive. From U.S. Route One in Arundel: Take Limerick Road to right onto Mountain Road, left onto Old Alfred Road and left onto Tamrox Drive. From Route 111: Take Old Alfred Road to right onto Tamrox Drive.